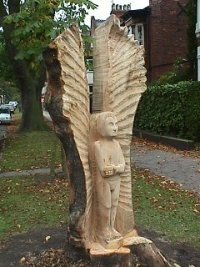 In the mid '90s many large trees in the Avenues Conservation Area in Hull, East Yorkshire, were being cut down to reduce subsidence. 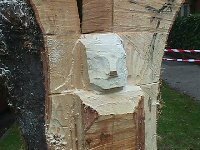 The residents regretted the loss of the trees, and Kevin Storch, a well-known local sculptor, agreed in principle to sculpt a trunk if it could be left in place. Hull City Council agreed to leave the trunk of a lime tree in Marlborough Avenue. The Residents' Association contributed to the cost of this project, and the sculpture also attracted funding from Quay Art, organisers of Hull's Art in the Open festival, whereby artists open their studios and special works are commissioned. As part of this festival, Kevin worked in Marlborough Avenue from 6 September to 10 October 1998. 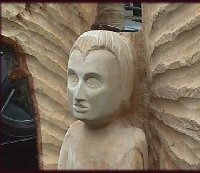 People came regularly to watch the angel's progress and talk to Kevin. 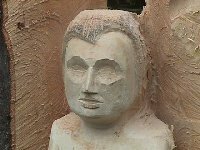 If you would like to follow the creation of this sculpture, you can go to the Diary page. Clicking on any date in the Diary will take you to that day's pictures. This site is not connected to any organisation, and receives no funding from any source.